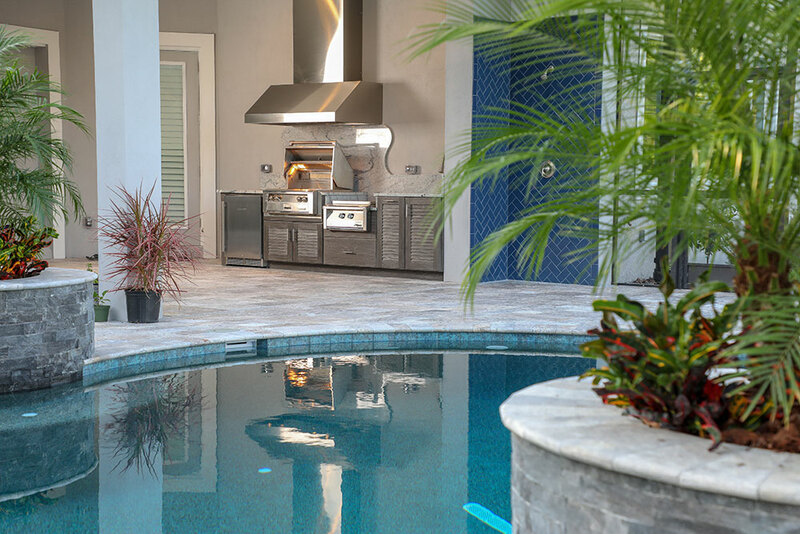 Our experienced Outdoor Living Specialists will work with you to create a customized space that’s designed and built to seamlessly blend with your home’s exterior. Our team can work with existing spaces or create entirely new spaces to get the most out of outdoor living. Our projects are turnkey and can be customized to feature almost anything you want. We look forward to helping you create the outdoor living space you’ve always dreamed of. Stay cozy outdoors year-round by adding a fire pit or fire place. We offer multiple options from fully customized designs to prefabricated units that are for ready for use almost instantly. Our team can create wood-burning or gas-fueled fire features. Let us create a beautiful focal point of your backyard that can raise your home’s value. Our experienced Outdoor Living Specialists will create a customized roofing structure based on your lifestyle. Our team will design and build these structures to tie in with the exterior of your home. When possible, we match the materials to make these structures appear as natural-looking extensions of your home. Our team can customize these structures with lights, TV’s or sound systems. 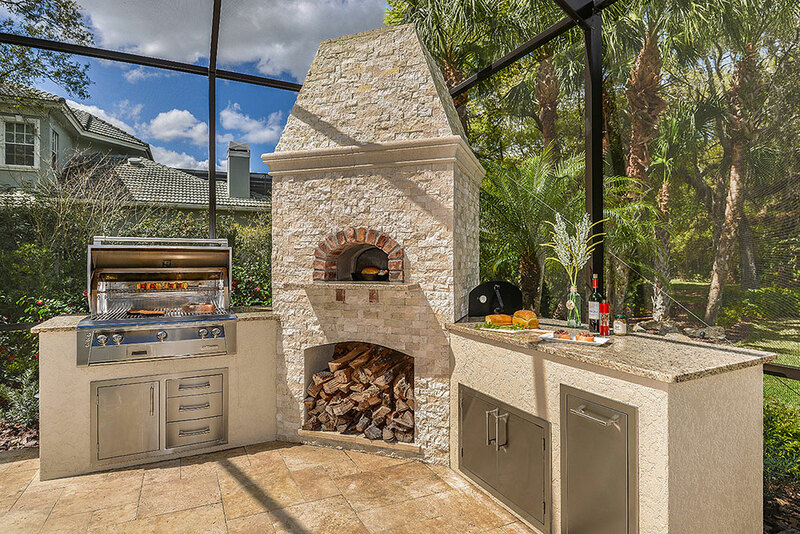 Bring restaurant-quality results to your outdoor living space with a pizza oven. Our team is experienced in building custom wood-or gas-burning pizza ovens. We offer multiple solutions from countertop to built-in ovens. 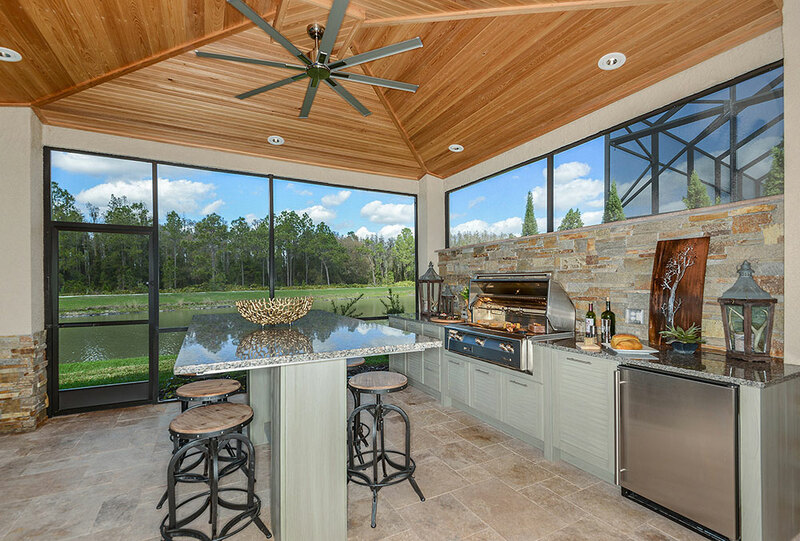 Whether you’re having us construct your outdoor kitchen with these cabinets or just looking to add some storage outside, we offer a unique encapsulated polymer cabinet line that can hold up to the Florida elements. These cabinets won’t warp, fade or crack. Ask your Outdoor Living Specialist about this option. Have you recently bought a home that has an old grill or did your current grill at home give out? 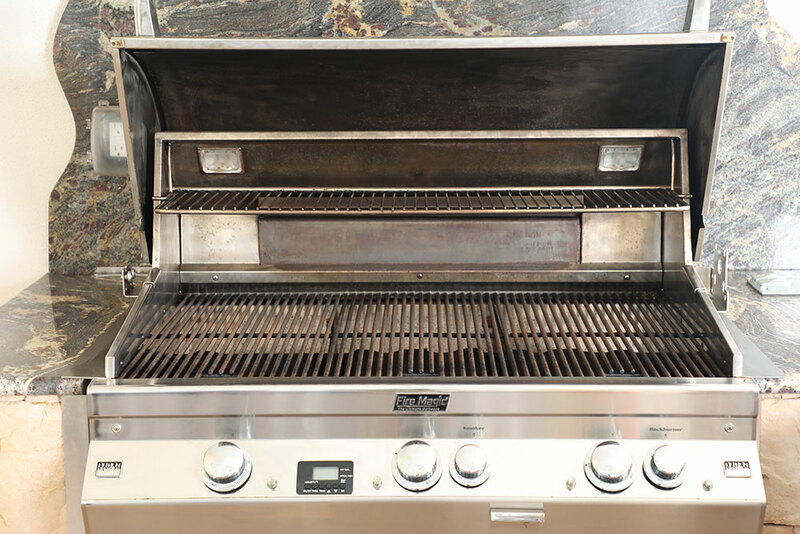 Our experienced can easily replace your old built-in grill with a new one. Our team is able to replace most grills, even if the area might need to be slightly retrofitted. 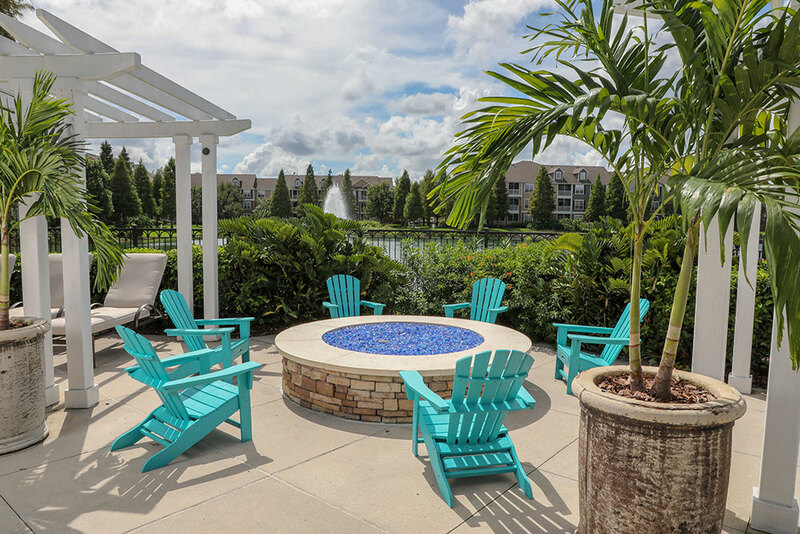 Complete your outdoor space with comfortable and durable seating options. We offer premium furniture from Summer Classics. 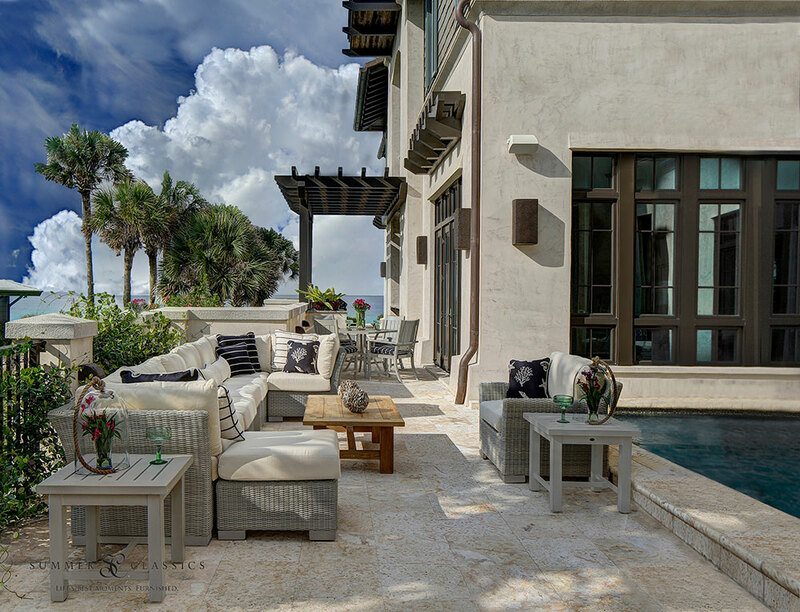 Talk with one of our experienced Outdoor Living Specialists about your options to relaxing in style outside today. Quality grills aren’t cheap and can take a beating without proper care. To protect your investment, it’s recommended to have your grill cleaned every 6 months. Our detailing service features a proprietary cleaner that is safe for you and tough on grease and oils. Our team will make your grill look like new again and keep it running smoothly. Get in touch to schedule your cleaning today. Looking to do a project yourself but need to get materials? Our experienced team can help with appliances, frames, cabinets, stone finishes and countertops. 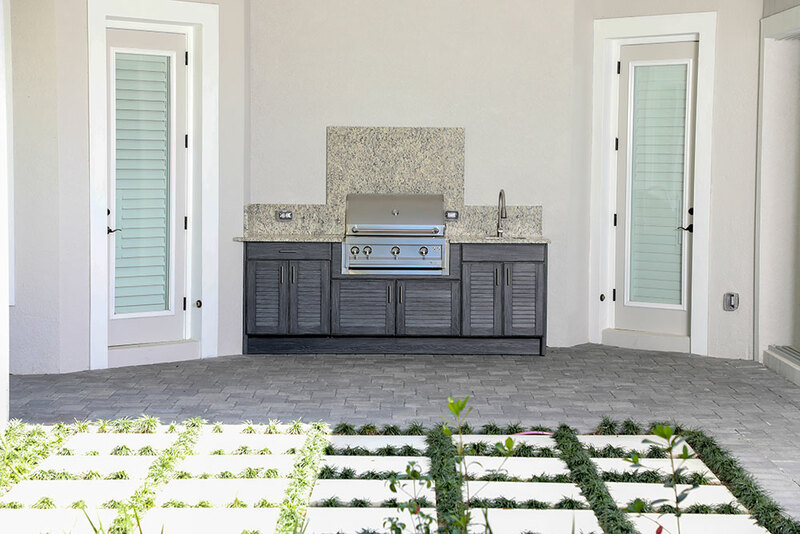 Contact one of our Outdoor Living Specialists to learn more about how Just Grillin Outdoor Living can get you ready to tackle your project.